Many banks have their own travel rewards system. Amex has Membership Rewards. Chase has Ultimate Rewards. And Citi has ThankYou Points. The two elite Citi cards that earn TY points are Prestige and Premier cards. This is a head to head comparison of the Citi Prestige vs Premier MasterCards. You can read a more in depth review of the Prestige benefits here. The Prestige card is most comparable to the Amex Platinum card (I pit those two head to head here), while the Premier would be the Amex Gold. The Prestige has more benefits but comes with a much higher (and no waived in the first year) fee of $450. The Premier card is $95 per year and is waived the first year. If you are going to get both cards, there really isn’t a point in keeping the Premier card past the first year which would require you to pay the $95 annual fee. In addition, if you have a CitiGold Checking Account you receive $100 off the annual fee on the Prestige card, bringing it down to $350 per year. At this time, the sign up bonus for each card is 50,000 ThankYou Points. Technically, if you were just to get one card or the other, the ThankYou points are more valuable with the Prestige card (see below on redemption bonus). But if you get both cards, you can combine the points; making them essentially the same value. If you only get one card, the Prestige TY Points are worth 1.6 cents each for $800 and the Premier TY Points are worth 1.25 cents each for $625. Obviously the sign up bonus can change; however I would not suggest signing up for either for less than 50,000 points (I was able to get 60,000 for the Premier card). The minimum spend to earn the bonus is $3,000 in the first 3 months for each card. Even though Prestige is the more elite card, Premier offers better bonus categories for earning points. With the Premier card, you get 3 points/$1 spend on all travel (air, car rental, hotels, etc) AND on gas. For Prestige, you only get the 3 points/$1 on air and hotels. Both cards offer 2 points/$1 on restaurants and entertainment. All other spend earns at 1 point/$1 spent. The most valuable way to redeem your ThankYou Points is through travel rewards. When redeeming your Premier points you get a value of 1.25 cents for all travel booking across any brand. Prestige, on the other hand, gives you value of 1 cent for hotels, car rentals, and cruises. The bonus for Prestige is when you redeem for airfare. Any flight redemption values your points at 1.33 cents a piece except for when you book American Airlines. Then you get a whopping 1.6 cents per point. Of note, if you get both cards, you can choose to combine your ThankYou Points in to one account. When you do that, the points become identical. It is a much better deal to combine them in to your Prestige account and then use them for flights. Another important piece of information: when you redeem your points for airfare or hotels, it counts as a paid stay. So you will still earn miles/points with the airline or hotel and it will credit towards elite status with their program. This is where you get a good return for the high annual fee of the Prestige card. For airport lounges you get a Priority Pass membership as well as access to Admirals Club when traveling on American Airlines. The Priority Pass is especially valuable as it gives access to you AND 2 guests (unlike Priority Pass with Amex). With the Prestige you also get an annual $250 credit towards airline purchases including ticket purchases. Again, much more generous than Amex that only allows you to use it on incidentals like change fees and inflight purchases. What is especially great is you get the credit each calendar year. Meaning if you apply for the card in June, you have until December 31 to use up your $250 credit and then another $250 beginning on January 1. That’s $500 for your first year with this card. Additional benefits include a $100 credit towards Global Entry with the Prestige card, free golfing, and 4th night free when staying at hotels. The only benefit worth noting that is included with Premier (and all Citi credit cards) is the Citi Price Rewind price protection. The Premier card is good if you just want some quick and easy points to use for travel. However, if you want to increase the value of those points, it is a good idea to add the Premier card. It is expensive, but it raises the value of your ThankYou Points and comes with some of the best perks of any credit card. Plus it pays for itself and then some during the first year due to the $500 total airline credits. 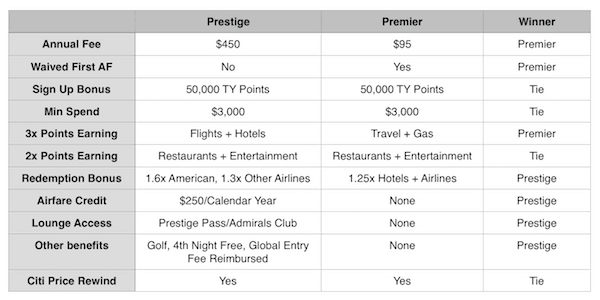 My take is that it shouldn’t be Citi Prestige vs Premier, but really should be Citi Prestige AND Premier. As always, I am not an accountant, money manager, lawyer or guru. This is just my take on the card, don’t take it as advice. Only those that are responsible with their spending should get credit cards. I do not get any payment or benefit from Citi or any other bank for any of my posts.